Brunei : When and where to go? One of the richest countries in the world and covered in equatorial forests, this small sultanate experiences a tropical climate; humid and hot all year round. Temperatures generally range between 22 and 32°C. The rainy season continues from September to January which is followed by the dry season from February to April. Mist is often present at daybreak due to the lakes. The best season to visit Brunei is during the dry season but going at the end of Ramadan (between November and December) has its advantages as it is at this time that the Sultan opens his Palace to visitors, both local and foreign. Brunei doesn’t necessarily justify a whole long holiday to itself but it is definitely worth including as part of a trip to Malaysia or Singapore, for example. The Capital, Bandar Seri Begawan, a lake city, is very charming with its wooden houses on stilts between which circulate motor boats. Its mosque with a golden dome enables you to enjoy a magnificent view over the whole city. The Sultan’s Palace is one of the most dazzling buildings in the world and the Hassanal Balkiah Aquarium is worth a visit for the variety and fabulous display of local underwater life. The National Park of Belalong, in the district of Tempurong to the East, is a great way to discover the rare species of wild life and plant life in this area. Take the canopy walkway, a metallic raised bridge that takes you among the trees. You could also explore the jungle or visit the Medaram Falls and there are lovely white sand beaches close to the Capital that are worth a visit. All in all there is plenty to fill your days with a short stay in Brunei. You need to possess a valid passport to visit the country and a visa if you are planning to stay in the country for more than 14 days. 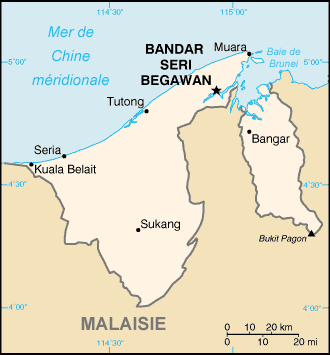 The currency in circulation is the Brunei Dollar (BND). You can get to Brunei by plane directly from London or by passing through Singapore, Hong Kong or Bali. Once there, you will find a bus station in the centre of Bangar Seri Begawan: Several bus lines serve different areas of the city. Taxis are numerous and are reasonably priced. Prices in general are similar to those in Western Europe except for the food which is relatively inexpensive and of a very good quality and choice: Malaysian, Chinese and Indonesian specialties and local tropical fruit. You will certainly be spoilt for choice at a price that will not break your wallet in the markets or local fast food restaurants. You can find a good meal for less than €10 although a room in a reasonable hotel can cost over €50. If you would like to find some souvenirs to take home then the local arts and crafts are excellent choices: Silver and brass jewellery, sarongs, carved wooden boxes, gongs, spices….